It’s hard to pay attention to the international conversation and not feel anxious, at the very least. Tensions all over the globe are strung as tight as they can be, and in some places those tensions have snapped. International conflicts in the Middle East are raging deep into their second decade, while what looks more and more like a second Cold War rears its head between Russia and the rest of the world, Boko Haram continues its unbelievable bloodshed in Nigeria, and bombings thunder through Yemen. To the West, most of these issues seemed comfortably distant across oceans or thick borders, but on January 7, that distance was closed. The attack against Charlie Hebdo in Paris brought into stark focus cultural differences between the French publishing community and some religious extremists. It drew a stark line between those who believe in free speech at all costs, and others who find particular speech unforgivable acts of war. The question has now been raised over if this attack is a harbinger of the new future of a constant state of conflict, or if it is an isolated event. 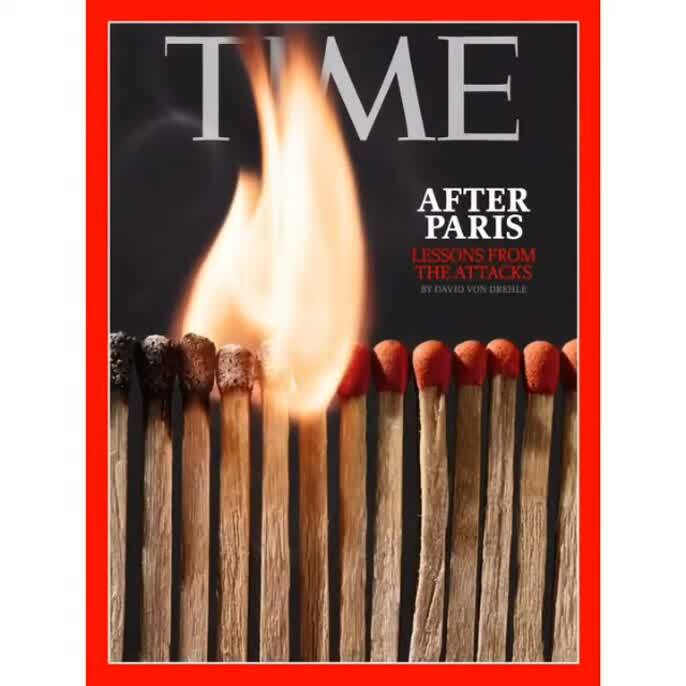 TIME Magazine posed this question in their January 24 issue with the cover story, “After Paris.” Photographer Jamie Chung was tasked with bringing these incredibly complex and emotional ideas into a single image for the cover, and did so in record time. Like a tinderbox in the midst of catching, Jamie lined up a series of matches, and captured the ignition from one to the other. Each match throws off its own explosion in the parade of one to the other, without knowing how far it will go. It encapsulates not only the damage that we see in our recent past, but the future we have laid ahead of us if we do not take action. The fire burns, and threatens to go further, unless we find another way. Like everything in the news world, this project happened quickly, going from assignment to newsstands in less than two days, and not only was it lionized on the cover of TIME, but the magazine animated it for their Instagram account. Check out the cover, and press play to see Jamie's composition in action.